Mercedes-Benz AMG Vision Gran Turismo? Powerful, fast and as graceful as a big cat on the hunt. Extreme proportions, sensual contours and precise graphics blend to form a body that visually confirms the breathtaking performance of 430 kW (585 hp) and 800 Nm of torque. An elegant contrast with the flowing, sensual contours is created by the clear geometric graphical elements that highlight technical features such as the headlamps, radiator grille and tail lights. The angled headlamps, with their color scheme and determined look, convey a sense of sportiness and readiness to leap forward. This impression is reinforced by the bonnet with its expressive forms and motorsport details, such as the release catches on the bonnet and the fuel cap, for example. The red-glowing contour lines on the lower part of the vehicle create an effect similar to that of exterior ambient lighting and stand out from the silver-painted bodywork. 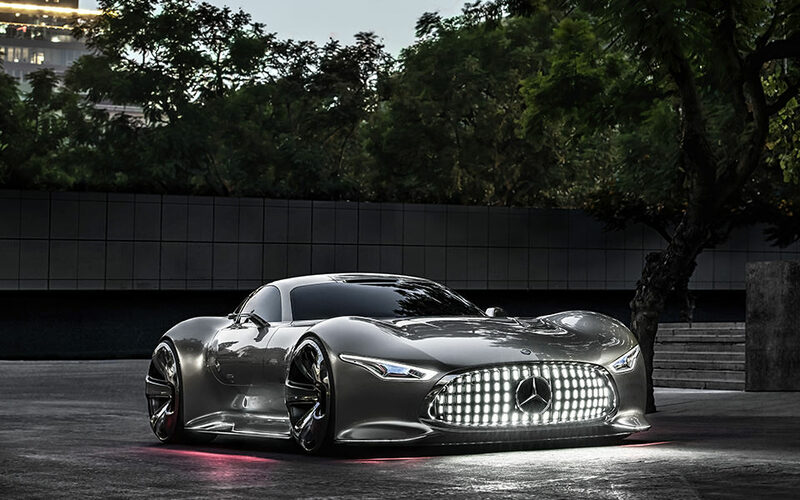 This makes the Mercedes-Benz AMG Vision Gran Turismo look even more aggressive. Take a look at this futuristic Beauty and write down Your own opinion can it be Your Dreamed present for Christmas. Share Your Dream with us and infect Others with Your Idea or Christmas Wish. Click on e-mail address MyDream@Men-Dream.com, send it to us, and we will post Your Dream. Who knows, maybe someday Your Wish will come True.